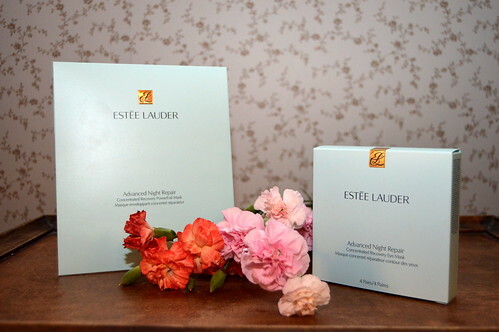 A few weeks ago (post) I told you about how I pampered myself the day before my sister’s wedding with an at home facial using two Estée Lauder products of the Advanced Night Repair collection: the face mask and the eye mask. Today you can read the review about the face mask and next week I will fill you in on the eye mask! Garnier Hydra Bomb mask (2,99 EUR) is a very good budget mask which works especially on the hydration. You can read a review about this mask here. Filorga Time Filler and Filorga Hydra Filler mask (9,99 EUR) are medium prices sheet masks. I have tried them out already but I want to try them out again before doing my review. 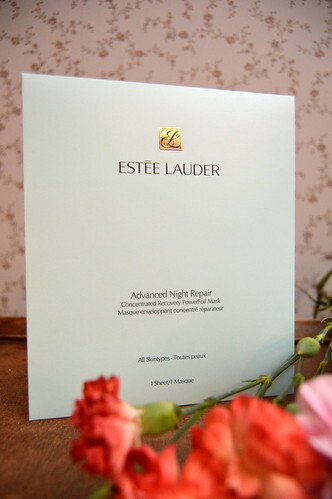 Estée LauderAdvanced Night Repair Concentrated Recovery Powerfoil Mask (23,50 EUR). Read on to find out what I think about this one! Well… 23,50 EUR for one sheet mask… I sure hope it is worth the money!! Our Worldwide First: PowerFoil. High-performance foil-backed sheet mask creates a protective barrier, allowing our potent technologies to penetrate fast and deep within skin’s surface and helping to lock in moisture. 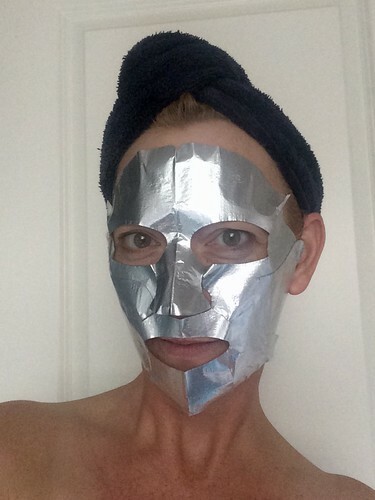 Looking a bit like a tin man… but it’s all for a good cause! Make sure to apply this mask on a clean face. This mask comes in 2 parts: a top and bottom half. Carefully open up each part and place on your face. You might want to adjust it a bit. Leave on the foil! Wait for 10 minutes and then remove the mask. Gently massage in any remaining liquid. My skin definitely feels firmer. My skin looks and feels deeply hydrated. On below picture you can see that my face looks fresh, smooth and radiant. Now the following may sound a bit like a con, but it really isn’t! When the sheet is placed on your face, it will probably feel a bit warm and tingling. You might find this a bit weird, or you may think you react allergically to this beauty product… but don’t be alarmed! Just leave the mask on for 10 minutes and you’ll see you haven’t turned into a tomato 😉 I guess the tingling feeling are just all the ingredients and the foil doing their excellent work!! When after 10 minutes you take off the foil, you can massage in the excess serum on your face, neck and cleavage (there’s so much serum… I even used some on the back of my hands!). 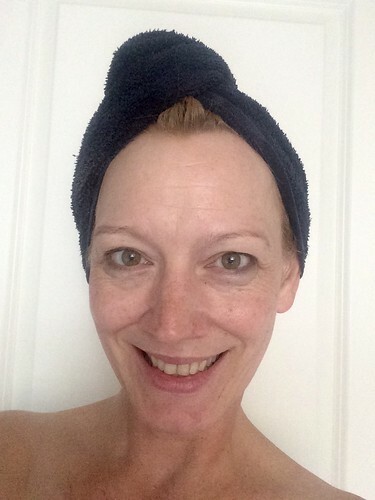 The after-shot… my skin looks (and feels) fresher! The price… such a shame it’s so expensive or I would just use this every single week as is actually ‘prescribed’ by the Estée Lauder website… I wish! This super de luxe sheet mask is definitely worth its money!! Perhaps not for weekly use as that might get a tad expensive, but definitely to be recommended for special occasions! 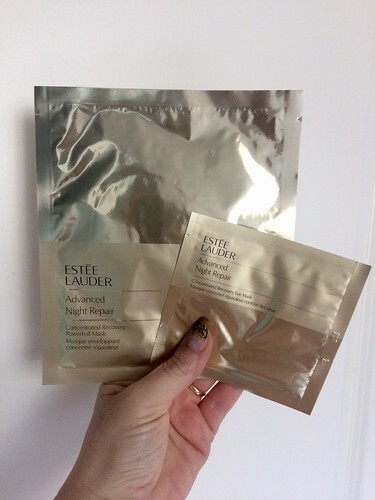 This entry was posted in Beauty, Skincare and tagged advanced night repair, beauty, concentrated recovery powerfoil mask, estée lauder, sheet mask, tissue mask. Expensive indeed. But to pamper yourself once in a while maybe worth it 😃!